Only a couple of days are left until Microsoft's "everyone, gather around and grab a free copy of Windows 10" offer expires. Without getting into the "should you, or should not you" argument again when it comes to the upgrade offer to Windows 10, you may wonder if there is a way to grab the license of Windows 10 without actually using the operating system right away. There are good reasons for upgrading to Windows 10, and there are reasons not to upgrade. Some users might want to grab the license while it is free, and continue to use another version of Windows for the time being. The main idea behind the train of thought is that you could upgrade to Windows 10 at a later point in time without having to pay money for it. While you may use Windows 7 SP1 until 2020 and Windows 8.1 until 2023, as security patches will be delivered until then by Microsoft, you may need to upgrade early depending on how you use the computer. For instance, new hardware released in the coming years may not be compatible with Windows 7 or 8 as Microsoft does not need to provide feature updates to Windows 7 anymore already, and soon no longer for Windows 8. Ultimately, when support is dropped, you will have to make a decision. Sure, you could continue using the operating system but without security patches, that is not really recommended. You could switch to Linux or another operating system, or, upgrade to Windows 10 at that point. First thing you need to know is that you cannot reserve a license without installing the operating system on the device. That's unfortunate but there is no way around this that I know of. Good news is that once you have installed Windows 10 on the device, that device is linked to the operating system using a Microsoft Account. Basically, Microsoft links the PC to the Windows 10 license, and will activate the operating system whenever it is installed on the machine. Upgrade to Windows 10, then use the roll back functionality to go back to Windows 7 Service Pack 1 or Windows 8.1. This method requires little preparation, but is a bit of a hit and miss operation. Basically, what you do is download and use the Windows 10 Upgrade Tool to upgrade to Windows 10. Once done, press Windows-I, and go to Update & Security > Recovery and select the "Go back to" option listed there for the first 30 days after installation. The upgrade and downgrade may work well and if it does, is one of the fastest options that you have. You may run into issues however, for instance while downgrading, and that is why you should create a system backup before you perform the operation. If you create a system backup anyway, you may as well restore it after you have upgraded to Windows 10 on the machine. You may use quite a few programs to create the backup. 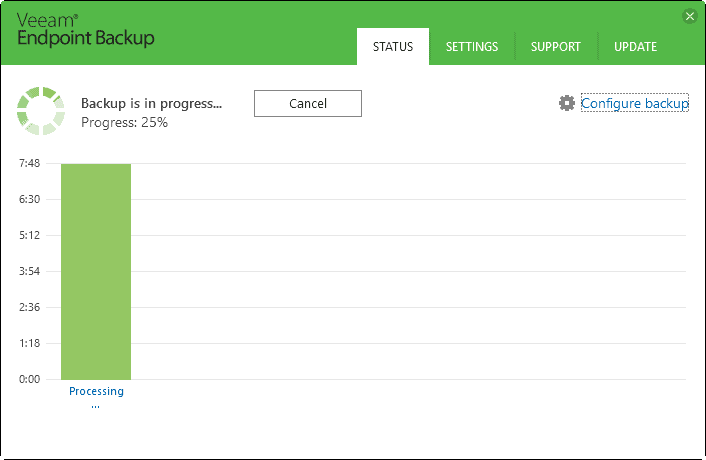 I prefer Veeam Endpoint Backup but you may use backup programs like Macrium Reflect or one of these drive backup programs instead. Please note that you need enough storage space for the backup. If the main drive that Windows is installed on occupies 80 or so Gigabytes, you need at least that amount of space on another hard drive preferably to back up the data. Run the upgrade once you have created the backup (and verified it). Once done, run the backup software again (or use a standalone copy of it), and restore the backup that you have created. The following method requires that you have at least one other hard drive with enough space at your disposal. Also, you need to original product key for this to work. Download the latest Windows 10 ISO image from Microsoft. Create a bootable USB drive with the installation files. Disconnect the main hard drive, connect the secondary hard drive you have lying around. Connect the USB drive to the PC as well. Boot the PC from the USB drive and follow the installation dialog to install Windows 10. You are asked to enter the product key at one point in time for activation. Once Windows 10 is activated, power down the machine, and connect the disconnected drive again. The PC should boot into the old operating system as if nothing happened. Once Windows 10 is installed, make sure the operating system is activated before you restore the previous version of Windows. Go to Update & Security > Activation. It should read "Windows is activated" and "Windows 10 on this device is activated with a digital entitlement". Also, if you are not totally against Windows 10, you may want to use it for some time to find out whether you like it. Just note that the roll back option is only available for the first 30 days. If you want step by step instructions check out How To Geek's guide. Find out how to reserve Microsoft's Windows 10 operating system on a machine running Windows 7 or Windows 8 without using it. I have a Windows 8.1 license, but I’ve been running the Windows 10 Insider preview for over a year. What about me? I’m pretty sure I’ve used my Microsoft account for login on both 8.1 and 10. When you check activation, what does it state? Well, it’s activated, of course. Insider builds come with a free license and I don’t recall having to manually activate it. That being said, what I could do is, I could try to enter my Windows 8 product key here and now (i.e. while running the Insider build); that would presumably replace the product key that I got as part for the Insider program. If successful, maybe that would “unlock” Windows 10 for my Windows 8 license, so that I would be able to use it for installing Windows 10 in the future. Martin, you actually can reserve W10 without actually installing it. If it’s ok with you, I can link you to a thread on MDL. I still installed W10 and rolled back to W7 on sever computers, but the option to do this is there. Sure, links are fine. Thanks! Do be honest, I don’t remember if that thread shows you how to avoid doing a W10 upgrade and do a clean W10 directly, or if you can “reserve” W10 with those steps as well. Thanks, but nah. I’d much rather pay Microsoft for a version of Windows that I’d actually want to use (i.e. without forced updates or spyware). My time’s too valuable for this nonsense, and who’s to say there isn’t news we haven’t heard down the road that makes it worthwhile to keep your old Windows licenses? Changing one’s mind just before it’s too late (to get Windows 10, free goodie, miam) reminds me what farmers told me about the hens on the side of a road, finally deciding to cross just when a car arrives. I’m no Einstein that’s for sure but concerning Windows 10 I’ve made a decision a long time ago (end of 2015) after I had been so enthusiast before July 29th 2015 when Mighty 10 had been announced. Did that with a 8 Pro license like a month ago. Now I realise I didn’t check the Setting application :| It did say that Windows is activated in the regular Control panel though. I also used it for three or so hours. It’s not the 10 licence that I care this much, but rather the time that I spent to install three operating systems in a day. I will most definitely not waste hours and hours of my time, nor will I run the risk of messing up my two well-tuned and presently fine-running older Windows computers, by going to install an unwanted OS over the present one and then restoring a previously made system backup over that. Besides, I don’t think I will ever want Windows 10. To me it has major disadvantages (such as no WMC, less user control, telemetry issues) while literally every Win 10 feature that is being touted as an improvement (such as Store apps or Cortana) does not appeal to me at all. I cannot imagine any valid reason why, two years from now, I might suddenly change my mind and regret not having “reserved” a “free” option to install Windows 10. So, taking all this trouble and risk just to save a few hypothetical bucks? Come on! Apart from all this, Microsoft’s earning model with Windows 10 is no longer primarily based on selling OS user licenses, like in the past. With Windows 10, Microsoft is now going to focus on making money by selling things like system-tied apps, system-tied cloud space, system-tied advertisements, and aggregation of system-tied user data. So we can be sure that in the very near future, Microsoft will come with some new “special cheap offers” to lure people into this profitable Windows 10 realm. In fact I would not even be surprised if later this week, at the very last minute, Microsoft will suddenly and “generously” extend their “free” deadline with half a year or so. It all comes down to marketing tricks. Do you really need Windows 10? Maybe you do have some good reason, but if you didn’t install it by now already, then you probably don’t have a good reason. In that case, don’t let them trick you! Like Sebby, I’d rather pay MS for a proper OS in the future – or move to Linux if they don’t come up with one before 2023. Martin, thanks for this post. Very helpful. I’m thinking of using a modified approach. I’m running a Win 7 desktop machine with a RAID 1, two disk setup. In 2015, there frequent reports the Win 10 upgrade was breaking RAID setups (both 1 and 0) and it was difficult if not impossible to get it working again. The RAID was hardware based and managed with Intel Rapid Storage Technology drivers. This is what I have. I’m not finding any failure reports beyond late 2015, so Microsoft may have fixed this issue. I’m running Win 10 on two other laptops, and I like it, but my gut says the Win 10 upgrade will break the RAID on my desktop, and I’m not willing to risk it, or be forced to re-image from a backup. However, I have an extra pair of old working hard disks I replaced a year ago. I thinking of removing my two current disks for safe keeping, and putting in the two older working disks. I would then re-image this RAID 1 set so they match the newer disks, and then take the Win 10 upgrade. If it breaks the RAID, it won’t matter because once the upgrade is activated to my desktop machine and MS acct., I’ll pull the disks and install the newer undisturbed pair back and go on as if nothing happened. I’ll then be able to apply the Win 10 upgrade later if wanted to. Anyone see any reason why this approach would not work safely? That’s wrong. There is no need for those “security” patches. I use a cracked version of the world’s best operating system, the Windows XP SP3. I have never updated it. The automatic updates are disabled since Windows installation, which was done 5 years ago. The result: it is still working perfectly like a fresh install. I’m netbanking, buying items from webshops, playing games, etc. and no problems at all. :) My XP machine runs smoothly, quietly, and without anything breaking since those irritating patches have stopped. The last time I ran an update on my Win 7 computer, it broke two applications, so I uninstalled the updates and – to be safe from Win 10 – I’ve turned updates off. Nice and quiet here, too. I like being the master of the OS, not a slave to it. After reading Martins post I got antsy again and started thinking about doing 10 as an image and then going back to 7. But posters comments have changed my mind again. I made the decision to stay with 7 many months ago and nothing has changed my mind since. I have 7 running great on two machines with updates disabled completely. I always run sandboxed or virtual and never have any problems at all. I dont see why that will change. I also am dual-booting with linux mint, although rarely as I am still a 7 guy. My privacy means more to me than being cutting edge without it. Newer does not always mean better. There is an easier way which just takes a few minutes! First, use the free product WinToUSB and the latest Windows 10 TH2 ISO to make a fully bootable WindowsToGO USB drive (requires a USB 3.0 drive of 16GB or more – make sure you select the VHD option if using a USB 3 flash drive). This takes less than 10 minutes if you use a USB 3.0 HDD. Then you simply boot each of your Windows systems directly to Windows 10 from the USB drive – enter in the Product Key for that system (you can use ShowKeyPlus to get it or use a simple script file to automatically activate it). Now simply use the same USB drive to boot the next system you need to register for Windows 10 (you don’t need to run WinToUSB again). No need to swap over the hard drive inside the system! This method seemed to work great.. although it took 1.5 hrs to make the 17G (min) USB flash drive, and upon 1st run off of this flash drive, 2 reboots (as new updates were d/l’d and written to the USB drive plus one extra reboot for no apparent reason), then activation itself hung for like 30 mins before showing success. Subsequent computers booting off the USB drive took 10 minutes and no reboots. 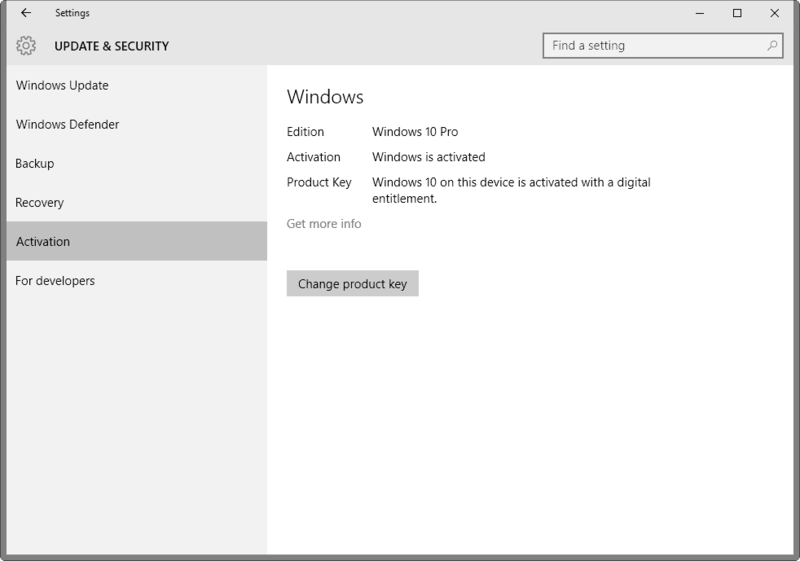 What is this “Windows 10 on this device is activated with a digital entitlement” you mention? I just checked all seven PCs I have upgraded so (mix of Windows 7 and 8.1) and they all say “Windows is Activated”, but none say anything about digital entitlement. Are you using local accounts? Ah, yes, all the accounts used are local accounts. i think it depends on where you look up the info. i use local account only from a clean install of th2 using win 7 retail key (on a new desktop). under control panel -> system and security -> system, (at the bottom where the activation bit is) it says activated. Well my OS-disk is getting low on free space. so i’ve bought a new one. I will mirror the OS to the new disk and expand the volume. So I don’t need to reinstall Win7 on the new disk. so I have at least the free copy. And NO I won’t use a MS account for it. Whether those who chose to upgrade realize it or not but those folks were being used by Microsoft as beta testers. It’s that simple. All the releases were nothing more then test updates. Even today what is being used by the Win-10 promoters is still just a beta. That’s why the big Anniversary Update next week is getting so much attention, it is essentially supposed to be the “stable’ release. And in practical terms, you are going to go through another big download and upgrade, hoping that nothing goes wrong. If you had problems upgrading or downgrading before, you get to experience the joy of going through it again. And if you are one of the upgrade procrastinators, you get to download/install/activate/test TWICE within a matter of weeks. Once Microsoft gets it’s final version smoothed out and all of you beta testers have solved Microsoft’s problems for them, then I MIGHT consider the upgrade. I will have no problem forking over the cash for a tested & stable release, but as for now, Win-10 is not ready, nor will it be next week. And who knows what will shake out of the French courts and which other countries might follow through. Privacy & security are becoming leading issues now and legal challenges could change a lot. While that’s yet to be seen, I’d still wait for a stable OS that’s been vetted by time and circumstance before I make the jump. That makes more sense than just about anything I’ve read. Aside from all of the “threats” that Win-10 is exposing us to, there is still the issue that Win-10 is not complete. That essentially means that next week when the Anniversary Update happens we start all over again and hope for the best. When has that ever happened before? And I didn’t even think about the French Federal lawsuit, That is a really big deal. I agree, Win-10 will be worthwhile later, but it’s just not ready now. I couldn’t have said it better. You guys have it right on target. Wait until the inevitable problems with the Anniversary Update get worked out an then it’ll be ready to make the move. I upgraded to win10 and then used http://www.nirsoft.net/utils/product_cd_key_viewer.html to find my win10 product key. I then downloaded the iso and did a clean install. When asked for key, I entered the one recovered. Install worked fine and activation too. you haven’t needed to do for around 9-10 months. with th2, you can clean install with a valid win 7 / 8.1? key directly. Couldn’t find better words than Henk van Setten (above). I had already disabled dozens of unwanted things on Win7 and it is still more like a black box what this OS does in the background. On Win10 there will be even more nebulous things to keep an eye on and I won’t waste that time for a OS anymore. Plus noone knows what MS will add and change in the future. I guess ads in games are only the first steps towards a OS marketing platform. I’m already using Linux to a good half and quite sure Win7 will be my last Windows OS as long this machine works.